There was a time when "Telltale" was just a game studio. But over the last few years, fueled by the success of 2012 Game of the Year contender The Walking Dead, it's become shorthand for a whole genre. That genre is in desperate need of a viable competitor to spur Telltale to fix some annoying, perennial flaws. Call it the modern adventure game, call it a Difficult Decision Simulator. Games like Telltale's The Walking Dead, The Wolf Among Us, and more recently Tales from the Borderlands and Game of Thrones have become a genre unto themselves. It's even commonly referred to as the "Telltale-style adventure game." Most people know what that shorthand entails, since all of those games have a few things in common. They're all "adventure games" in that they're mostly about solving puzzles and having conversations. They're all played in third person. They all have branching storylines where your decisions affect things that happen in later episodes. Wouldn't it be great if some other game could come along, take a similar formula, and do cool things with it? Maybe shake up Telltale's central assumptions and remind us of all the ways that Telltale games could improve? Oh hey wait! A game like that totally just came out! 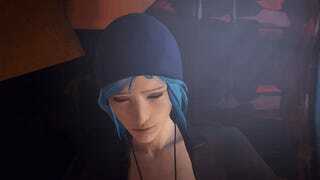 It's called Life is Strange. 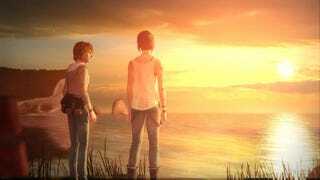 Life is Strange is—stop me if you've heard this—an episodic adventure game where your choices affect how the story unfolds. It's made by Dontnod Entertainment, the studio behind the flawed but cool action game Remember Me. It takes that game's neatest idea—the protagonist could hack into peoples' brains and "remix" their memories to fit her will—and repurposes it as a central mechanic in a more grounded setting. Kotaku UK's Keza MacDonald already wrote up her impressions of the first episode last week. That article was what initially got me interested in playing, and I'm glad I did. It does have issues, several of which Keza outlined. While it's generally nice-looking, the lip-synching is often bizarre, as Patrick already noted. The writing is this weird mix of compelling and awful, and its teenage cast talk less in actual American teen-speak and more in some weird amalgamation of dated internet-speak and dad-talk. (Note to Life is Strange writers: No one says "hella" or "phat" anymore!) (Note: Okay, yes, people do still say "hella." However, they do not say "hella" like Chloe says "hella" in this game.) Like last year's Beyond: Two Souls, it's a story about a supernatural American teenage girl written by an adult dude or dudes; the games have a lot in common, both for good and for ill, and I can't shake the feeling that that's a big part of why. I liked how Rock, Paper Shotgun's Philippa Warr fondly describes the game: She calls it reminiscent of a particular type of teenage fiction, "authored by people flexing their fledgling writing muscles within a framework of tropes. Taking them as a bundle they shared an oversaturated earnestness, like emotion could be achieved or amplified through a cocktail of adjectives and pathetic fallacy." It's like that. In a mostly good way. So: Cool game, iffy writing, loaded with tropes, dorky and lovable despite that. 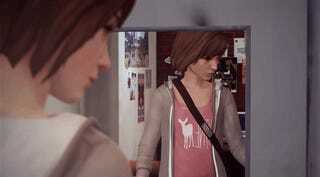 More relevant to the purposes of this article, Life is Strange also does several things better than Telltale's games, and actually works as a reminder of how much we forgive Telltale their trespasses. It's difficult to play Life is Strange and not come away hoping that Telltale is taking notes. Life is Strange was made using the Unreal engine, which looks and runs much more smoothly than Telltale's proprietary game tech. Characters are softened and not photorealistic, and the textures are all pretty low-res, but the game has a nice warm look. Granted, one could say the same thing about Telltale's games—they, too, have their own distinct art style. In fact, a screenshot from Life is Strange might not even look all that different from a screenshot from a given Telltale game. But Telltale's games generally look and run poorly on the company's engine, and man, can they be ugly in motion. Everything is so herky-jerky, and characters often move stiffly, like puppets. Every time I play a Telltale game I make the same notes, especially when I play a console version: The frame-rate dips a lot; the game hangs on conversational options; there are weird pauses and gaps between dialogue; and the action sequences are disjointed and sloppy. The newer games haven't necessarily produced improvements, and in some cases have made things worse: For example, the in-progress Game of Thrones series added a distracting shimmer the edges around characters and objects, like it's performing antialiasing with vaseline. As a result the game looks somehow smeared, even on new-gen consoles and PC. With each Telltale game I play, I have to fight the temptation to simply say, "Okay, that's just how it is, let's accept the technical roughness and talk about the story." No, dang it! Let's not accept it! Games should run better than this! Fifteen minutes of Life is Strange drives that home. Oh hey, this game works. It runs smoothly and looks nice. It isn't hitching and tripping all over itself every five minutes. Cool. The two games aren't even in the same league. Telltale is still using a hybrid point & click interface that lets you use a cursor to highlight objects in the environment, while Dontnod has come up with a super-slick way of having text pop off of objects in a way that mirrors its protagonist Max's notebook. Furthermore, Telltale awkwardly uses a cursor to have you "mouse" around the environment, while Dontnod has integrated interaction with the camera and Max's position. Dontnod pulled off some similar stuff with the augmented reality interfaces in Remember Me, and their new game is a cool evolution of the idea. It doesn't always work flawlessly—sometimes I have to get too close to objects to get Max to interact with them—but it's still miles beyond what Telltale is doing. If you asked me the central mechanic of a Telltale game, I'd probably say something vague like, "choices." 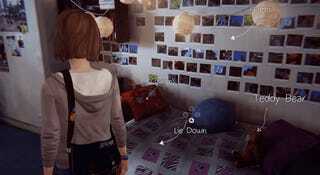 By way of contrast, Life is Strange has an actual central game idea, and the whole game is designed around it. Max, the character you play, is an 18-year-old girl attempting to navigate the ins and outs of life in a small-town Oregon high school. There's a twist: There are mysterious things happening, and Max finds that she's able to rewind time and undo recent decisions she's made. That mechanic becomes central to the game and is used both to solve puzzles (usually by interacting with objects in the correct order) and to "try out" different approaches to the game's various moral choices. You'll only be able to rewind through a given scene, though, so if you get stuck with lousy consequences for a choice you made, you can't go all the way back and undo it. I like how Life is Strange centers on an actual mechanical idea, rather than just telling a branching story. I'm not sure that approach is entirely necessary—Telltale's games do okay simply asking us to make difficult choices and live with the consequences—but it is refreshing. All four of Telltale's recent games have been licensed, based on other peoples' creations. Of those four, The Wolf Among Us felt the most stylistically distinct, partly because the Fables comics were one step further from a video game than the TV shows and games that support the other three series, and partly because the story—a noir prequel set in the 1980s—allowed for the most creative freedom. Telltale's other three games, particularly Game of Thrones and The Walking Dead, have all hewed very close to the tone and feel of their source material. Those games felt mostly like interactive versions of things we've already seen. That's not necessarily a bad thing, but when I fired up Life is Strange, it was refreshing to play a new game that was set in its own original universe with its own characters, style, and tone. That approach appears to have emboldened Dontnod to apply a creative flair that is simply missing from Telltale's games. So good! I would love to see more stylistic commitment like that in Telltale's games, but at the moment, they're playing it all much straighter. The more I play Telltale's games, the more their laserlike focus on plot wears on me. Telltale's clear philosophy seems to be to put plot first and character second; what we do learn about the characters we learn through their actions, through the things that they do. Rarely are we afforded a moment to just sit with them, to watch them in non-fraught situations, to get to know them as people. I'd love to have a little bit more time to actually explore and relax in these games, partly because it would make the inevitable tense moments that much more tense. Life is Strange almost wholly rejects that approach, and is content to spend large chunks of its first episode indulging in character development at the expense of moving the plot forward. It borrows liberally from both Gone Home and from David Cage games like Heavy Rain and Beyond: Two Souls, frequently giving its characters room to sit and wander and mess around. Max gets the most generous treatment, as the player is allowed to let her simply wander around her school, sit on a bench or lay on her bed and daydream, take photos, or flip through her journal. Other characters have their moments, too, as Max can explore their dorm rooms and homes, examining the small items they leave laying about and learning a bit more about what makes them tick. I don't mean to just rag on Telltale for no reason, and I generally like their games. (Episode 2 of Game of Thrones is a good time—we'll have more on it in a day or two once more of you have played it.) Furthermore, having only played the first episode of Life is Strange—the second one is out in March—I don't know whether Dontnod can keep things interesting for a whole season. And that's all in addition to the game's flaws, most of which I've already outlined. Regardless, it's cool to play a game like Life is Strange and be reminded that, oh yeah, Telltale doesn't actually have the market cornered on this entire genre. There's a lot of room for new ideas, and some of those new ideas can be winners.